Custom Airâ€™s annual maintenance program, for the heating season, begins in September for gas and oil furnaces with heat pumps and add-on heat pumps starting in October and running all the way through March. Due to critical charges needed on heat pumps, we must wait for cooler weather, and the equipment is operating in the heating mode, to ensure accurate checks on the refrigerant charge for peak performance of equipment. 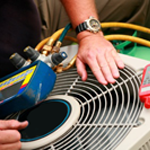 For air conditioner service, we wait for the temperatures to rise and the need for cooling is upon us. ps: Just as a reminder manufactures do not honor warranties when lack of maintenance is evident.